Change the funding system and approaches to international partnerships for US-led big science projects, urge Matt Mountain and Adam Cohen. Matt Mountain is president of the Association of Universities for Research in Astronomy (AURA), Washington DC, USA. Adam Cohen is president and chief executive of Associated Universities, Inc. (AUI),Washington DC, USA. Every ten years, US astronomers set research priorities for the following decade. The latest cycle to pick projects for the 2020s has just started. In July, the US National Academy of Sciences launched the seventh Astronomical Decadal Survey (Astro2020) with a call for proposals for future telescopes and space missions. Over the coming year, these will be collected, assessed and discussed in open meetings. A ranked list of priority projects will be released in 2021. Funding permitting, those at the top will be built over the next decades. The two-year process is widely viewed as a gold standard for building consensus — many other fields have adopted it, from Earth sciences to solid-state physics1. It carries weight with policymakers and funders. But as astronomy firmly enters the ‘big science’ era, we think that the decades-old system for funding federal astronomy needs debating and updating. The science has never been so exciting. Earth-like planets have been found orbiting other stars2. Cosmologists are quantifying mysterious forces of ‘dark matter’ and ‘dark energy’3. Completely new windows have been opened onto the cosmos thanks to facilities such as the Atacama Large Millimeter/submillimeter Array (ALMA) in Chile and the Laser Interferometer Gravitational-Wave Observatory (LIGO), in the states of Washington and Louisiana. But large facilities that can explore these frontiers cost billions of dollars and take decades to design, build and operate. ALMA was proposed in 1990 and became operational in 2013. The James Webb Space Telescope (JWST) was approved in 2000 and will be launched in 2021. The Large Synoptic Survey Telescope, recommended in 2010 and under construction in Chile, will begin to map the sky in 2023. The fruits of the 2020 Decadal Survey won’t see light until the 2030s. The US community faces a daunting task. Each generation of facilities is getting more expensive and harder to build. Operational costs are mounting. Meanwhile, the research budgets of the US National Science Foundation (NSF) and NASA have remained more or less flat since the 1990s (see ‘Astronomical costs’). Hard decisions have been made to close old but still-productive telescopes, which has proved insufficient to pay for new ones. And these pressures will only get worse as more big projects come online. International competition is growing. The European Space Agency has picked its key projects as far ahead as 2044, including an advanced X-ray space observatory. The European Southern Observatory has fully funded its Extremely Large Telescope (ELT) in Chile. From the mid-2020s, its 39-metre-diameter mirror will collect more than ten times as much light as the largest optical telescopes today. China opened the world’s biggest radio telescope in Guizhou province in 2016, and plans to launch a competitor to the Hubble Space Telescope4. Without a concerted effort, a US scientist in the 2030s will be left without similarly capable facilities. We will face an unacceptable dilemma: support existing grants and cede US leadership, or abandon funding for key areas of research to support a few world-leading facilities. As the presidents of organizations that build and operate major US publicly funded telescopes on behalf of the NSF and NASA, here we set out how entrenched assumptions and patterns of funding, development and collaboration must be reassessed. After the Second World War, the US federal government set up national observatories for radio and optical astronomy. The rationale was to boost national and economic security by investing in basic science. On the ground, this has led the NSF to establish major facilities such as the Very Large Array in New Mexico, the Gemini Telescopes in Hawaii and Chile, and, most recently, ALMA. In space, NASA runs iconic observatories such as the Hubble and Spitzer space telescopes and the Chandra X-Ray telescope. US astronomers from any institution compete through a peer-review process for time on telescopes. This mixed system has worked well for decades. But the next generation of ground-based telescopes has become so expensive that even consortia of universities and institutes are struggling, despite hefty contributions from billionaires, state governments and international partners. 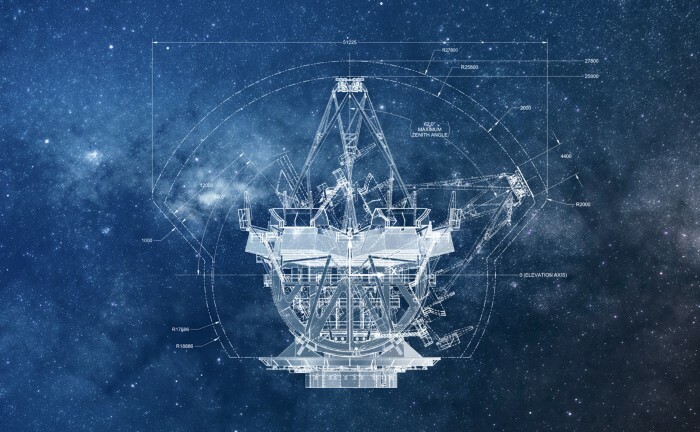 US-led efforts to construct giant telescopes to match the European ELT plans have stalled. Both the Giant Magellan Telescope (GMT), a 25-metre-mirror telescope under construction in Chile, and the Thirty Meter Telescope (TMT), which it is hoped will be built on Mauna Kea in Hawaii, have been unable to find the billion dollars or more that each will need. In May, the two teams joined forces and announced they would seek extra NSF funding through the Decadal Survey5. In return, they will enable broad US community access to the two telescopes, providing coverage of both hemispheres of the night sky. Space astronomy has always been federally supported, and is expensive. The total bill of the JWST has mounted to more than US$9 billion, not helped by a series of delays. The proposed Wide-Field Infrared Survey Telescope (WFIRST), which will examine exoplanets and dark energy should it launch in the late 2020s, would cost at least $3 billion. Both projects have come under fire for their costs. In February, US President Donald Trump proposed cancelling WFIRST, although Congress subsequently approved funding for it. Incoming NASA administrator Jim Bridenstine has queried the need for any large science missions. He said in May6: “If we can do smaller missions with multiple satellites, then any one of them that runs over doesn’t clobber the decadal [survey] not only for this decade but also the next decade”. Yet if inflation is taken into account, the cost of the JWST is comparable with that of the Hubble telescope: $3 billion in 1990 translates to around $9 billion today (see ‘Astronomical costs’, middle right panel). Even in its peak funding year (2014), the JWST consumed less than 4% of NASA’s total budget of $17.6 billion, or almost 13% of NASA’s science budget that year. Even so, the costs of major projects already under way are eating into existing budgets. This problem is particularly acute at the NSF, where the capital and operational costs of ground-based facilities are funded from different accounts. Each time the NSF issues an award to build a new telescope, the running costs must be found from the same limited pot of money that supports existing facilities and research grants. Other NSF-funded fields, such as ecology, face the same challenge. 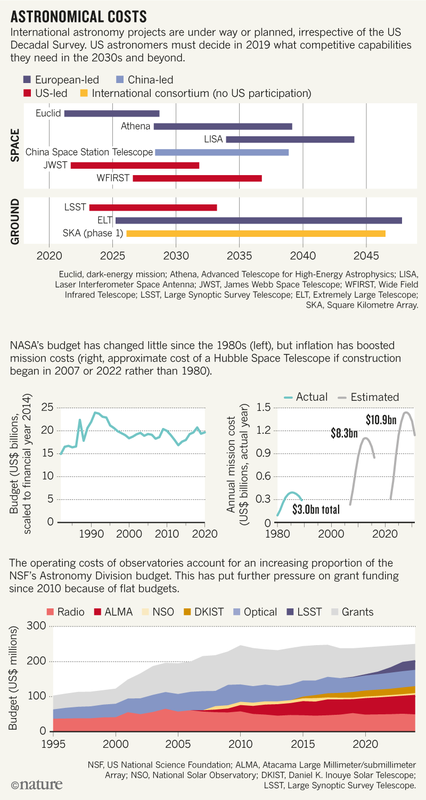 This NSF funding structure was predicated on the idea that old telescopes would be mothballed, and budgets would grow. Some facilities have been shut or divested. For example, the McMath Pierce Solar Telescope in southern Arizona is due to become part of the Kitt Peak Visitor Centre. The 44-year-old Blanco Telescope in Chile, which just discovered 12 new moons orbiting Jupiter, is now funded by the US Department of Energy and the NSF, together with funding agencies in the United Kingdom, Spain, Brazil and Germany, and contributions from institutions. But this strategy has reached its limits. Big science facilities will always be much more expensive to run than older, simpler ones. They are technically more complicated, use more energy and need many highly trained personnel. For example, the NSF contributes about $40 million a year to ALMA’s annual running cost of $120 million; international partners cover the rest7. The Blanco telescope, commissioned in 1974, requires only $7 million a year to operate. Financial pressure will only worsen in the 2020s if big facilities such as the GMT and the TMT come online. We can no longer assume that mothballing older facilities or taxing grants will magically work 20 years from now. There are not enough older telescopes in the NSF’s portfolio to shut down to pay for even part of the operational costs of these two proposed facilities. The choices for the community and agencies are stark8. Facilities will need to be funded appropriately from the start, and operations funds planned beyond the end dates of agencies’ budgets. Without realism and a genuine commitment to the next generations of scientists, the United States will give up its lead in areas of astronomy where it has excelled for decades. And this at a time when the scientific frontier of astronomy and astrophysics beckons more powerfully than at any other point since Galileo lifted his telescope to the night sky more than 400 years ago. Astronomers need to keep the following three points in mind while they discuss options for the 2020s and beyond. Recognize that size matters. Funding agencies and the community must accept that ever-larger facilities are inevitable if we are to explore frontiers. Astronomers are often asked whether they can get around the inexorable demand for larger telescopes by being more innovative. Can we do the same science with lots of small missions, for example? In many areas we cannot, at least with today’s engineering options. Physics is unforgiving if you are trying to detect the earliest galaxies some 13.5 billion light-years away, or an Earth-like planet around another star 30 light years away. Larger optical telescope mirrors, a bigger array of radio antennas and more-powerful computers are necessary to catch and process more photons. Other countries already recognize that 20–40-m telescopes are inevitably the next step for optical astronomy on the ground, for example. Plan internationally. Future big science facilities must be multinational, if they are to be fully funded given the constraints and priorities for US federal funding. International planning and collaborations must be integrated into US plans. For example, the scientific potential, challenges and $1.3-billion price tag of building ALMA at high altitude in Chile resulted in a partnership between the United States, Canada, Europe, Japan, South Korea, Taiwan and Chile. The JWST would not get off the ground without the 15% contribution from the European Space Agency and a 5% contribution from the Canadian Space Agency. US researchers can no longer draw up their plans in splendid isolation, but must work alongside other nations’ schedules. These collaborations necessitate sharing of valuable telescope time and data with international partners, but also yield richer science that benefits the entire community. Think long-term. The ten-year window of traditional decadal surveys is now insufficient to lay out a compelling, globally relevant science programme. Astronomers need to lay out the scientific narrative for at least the next 20 years. Each subsequent survey can always apply course corrections on a decadal cadence in response to a changing scientific landscape. In this context, the impact of inflation needs to be recognized. Economic factors alone increase the costs of large projects whose development spans decades. Long-term projects resulting from the upcoming Decadal Survey have to be seen in this context. Facilities such as the JWST cannot be viewed as one-off burdens, but as long-term investments. Without this vision we would never have had the Hubble Space Telescope, ALMA or LIGO. We need to recognize the real impact of indexing the funding for our long-term big projects with inflation, and not just try to count the cost in today’s dollars — or worse, yesterday’s. We can no longer build a Hubble Space Telescope for $3 billion. National Academies. The Space Science Decadal Surveys: Lessons Learned and Best Practices (National Academies Press, 2015). Borucki, W. J. et al. Astrophys. J. 736, 19 (2011). Riess, A. G. et al. Astrophys. J. 855, 136 (2018). Zhan, H. A Chinese Roadmap of Space Astronomy & the Chinese Space Station Optical Survey. Kavli IAU Workshop on Global Coordination of Ground and Space Astrophysics, Leiden, 17–19 July 2017. Overbye, D. ‘Extremely Large, Extremely Expensive: The Race for the Next Giant Telescopes’ The New York Times (11 June 2018). Foust, J. ‘Bridenstine optimistic WFIRST will avoid cancellation’ Space News (17 May 2018). National Science Board. Study of Operations and Maintenance Costs for NSF Facilities (NSF, 2018). National Academies. Powering Science: NASA’s Large Strategic Science Missions (National Academies Press, 2017).